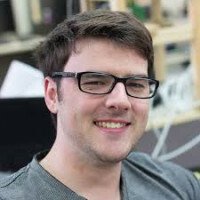 Edward Blanch has been a member of the Melbourne games community for a number of years working on a variety of titles on Mobile, PC and Console. With a background in Architecture, he brings a blend of art, shader and code to help bring fantasy environments to life. He is currently the lead technical Artist for Tin Man Games, instrumental in bringing Warlock of Firetop Mountain (https://www.youtube.com/watch?v=VE8OhYrkYoA) and an exciting new VR title called Table of Tales: The Crooked Crown (https://www.youtube.com/watch?v=CN8-xcjE9Qk) to life. More information about Tin Man Games can be found at http://tinmangames.com.au/ and his own Twitter @TechArtEd. This talk is going to use the development of a Sony Funded PSVR game as a case study in how to optimise for large numbers of dynamic objects in a VR environment. The nature of the project required many custom solutions that departed dramatically from the typical Unity render pipeline. Using code examples, performance benchmarks and GPU traces from the project the talk will walk through modern graphics pipelines, shader/lighting optimisation and performance bottlenecks. We will compare this to a more typical high performance VR project and show how to understand where Unity performs well and where alternate solutions may be needed. While this talk will focus on Unity and PS4 as the primary environments many of the elements discussed are applicable to different engines and platforms. The talk will be constructed from the dual experiences of the Lead Programmer and the Lead Technical artist on the project.